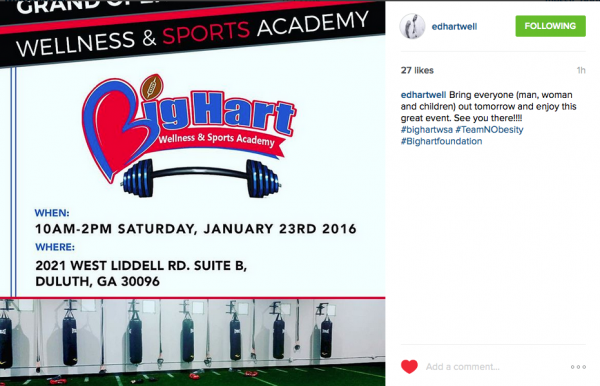 Ed Hartwell hosts Grand Opening “Big Hart Sports & Fitness Academy in Duluth” 1/23 at 10am | WHY Jonell PR? Ed Hartwell Former Atlanta Falcon is opening a NEW GYM in Duluth….. The grand opening will be January 23rd and kick off with a fitness class starting at 10:00 am and this class will be free. Men, Women and Children! Everyone is welcome to come out! The gym is in Duluth located off Pleasant Hill Rd….see address below.